The Premier League never seems to "do" fair. A fair result perhaps at Turf Moor yesterday would have been a draw. June is without doubt the quietest month in the year for domestic football. We either turn our attentions to a World Cup or a European Championship or we just wait for any news coming out of Turf Moor. May brought with it the end of the 2006/07 season with a final game against Coventry City, but it was very much a busy month at Turf Moor as the club celebrated its 125th anniversary. December, January, February, March - as the monthly reviews were written there wasn't a single victory to boast about. Then suddenly it was like the X43 bus service, after waiting for an age one came, then another and then another. We were disappointed not to have won a game in December, concerned when we didn't win one in January and worried when February too didn't bring a solitary victory, and another month has almost seen panic set in. February came as the window closed and what we all thought had been a disappointing last day of transfer dealing as we hoped there might just be another new player. 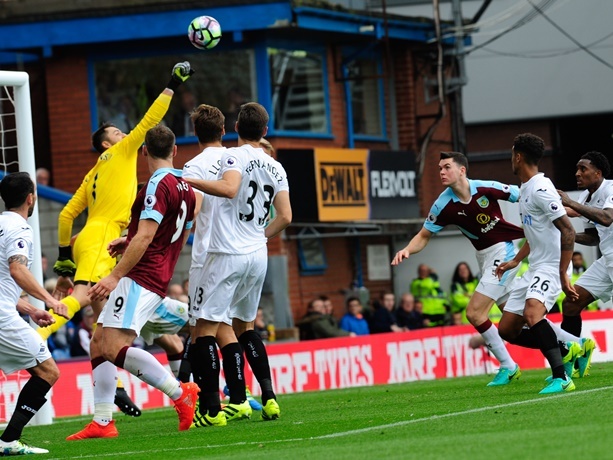 The New Year arrived and again the Burnley fans waited for the news that players would be sold, and once again they were as both Micah Hyde and Gifton Noel-Williams left Turf Moor, but this time it was a January with a difference. We all knew November would be difficult but the month didn't look too bad at all when we ended it with a comfortable win against relegation threatened Leeds just two days before the end of the month. • What's the weather doing?